See how generosity has been at work in the lives of patients and families in the Parkview Foundation Generosity Report. 100% of every gift made through Parkview Foundations is used to benefit our patients, their families and the care received at Parkview locations. Below are just a few examples of how donors have enhanced and supported excellent care. The Parkview Noble Foundation Mini-Grant helps the staff of Parkview Noble Hospital touch lives of patients every day and helps see the needs of both their patients and their co-workers. The mini-grant process allows individuals and work units to apply for funding for their patient care ideas. The $1,000 grants are funded through the generosity of donors. Don Harmon, a recent patient at Parkview Regional Medical Center, donated one of his personal photographs to the STICU department in recognition of and thanks for the excellent and lifesaving care he received. 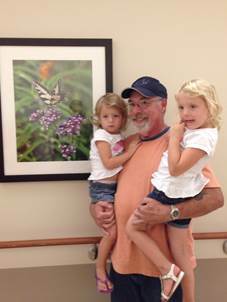 Don is pictured here with his granddaughters next to the donated photograph that can now be seen hanging in one of the STICU hallways. The 18th Annual Parkview Wabash Golf Scramble was a great day of golfing and networking with friends - in spite of a wet start! Thanks to the participation and support of 50 teams, many event and hole sponsors, as well as wonderful hospital and community volunteers, the event was a great success. The net proceeds of $20,000 will help purchase a new stereotactic breast biopsy system, which will enhance biopsies performed at Parkview Wabash Hospital. It is a rewarding result of everyone's participation and efforts. Donors to Parkview LaGrange Foundation will provide resources for Med/Surg and Family Birthing Center bags. The Med/Surg sleep kits include a lavender-scented hot/cold eye pillow, peppermint lip balm, and ear plugs. The Family Birthing Center comfort kits, in addition to the eye pillow, lip balm, and ear plugs, will also contain lavender baby lotion and a tennis ball. Generous gifts from donors through the Parkview Noble Foundation are supporting the purchase of an anti-gravity treadmill for the Parkview Noble Therapy department. The Alter G Treadmill and Lift Access will provide extra support and security to patients as they re-learn how to walk and run. 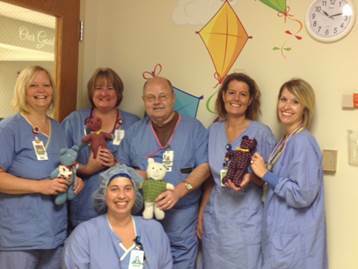 RSVP (Retired Senior Volunteer Program) recently donated 50 handmade bears to be distributed to Parkview Noble Hospital pediatric surgical and emergency room patients. Each bear is lovingly hand made and provides that extra comfort for little ones who are scared and uncertain. Congratulations to Parkview co-workers Ashley Beam, Logan Ison, and Heather Menshy who were named the first recipients of the Cathy E. Harris Good Samaritan Scholarship. The scholarship is available to any Parkview co-worker who is enrolled in a Basic EMT, Advanced EMT, or Paramedic program. Scholarships are granted to students pursuing a career in nursing through the Sue Johnson, Darlene Tielker and Florence L.M. Rolland Scholarship funds at the Parkview Foundation, and the Jill Dreyer Scholarship Fund at the Parkview Huntington Foundation, in addition to several other scholarships provided in LaGrange, Noble and Whitley County communities through donor generosity. See video stories about how your generosity heals at Parkview on our YouTube channel.